C++ firmware design and development. 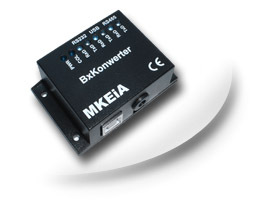 BxKonwerter is an unique device on the market which combines three serial interfaces USB/RS232/RS485 working at the same time. The circuit of the converter is based on ARM microcontroller STM32F103 which main function is making an algorithm to take data from one interface and directing them to two other. In the case when data are received from two or three interfaces by the device the sequence of them is the main determinant from which interface to which information will be transferred. At the same time the data from other interfaces are buffered to 512 bytes on interface, and then when silence on the line of the current interface will be longer then 4 bytes the converter will start to send the data previously buffered to the other interfaces in order in which were they received. The device can also work in mode without USB port as RS232/RS485 converter. In this mode the power supply of the converter is from outside power supply from 4V to 12V. Additionally, transmission speed which is the same for all interfaces and parity control are made when opening USB port (virtual COM port) and remembered in nonvolatile internal memory. It helps to configure parameters of transmission easily. The converter (USB port) is seen by the Windows operating system as a virtual serial port, which number can be changed. The device uses standard data libraries and drivers. RS232 interface signals are simplified to TxD transmitter and to RxD receiver without any additional controlling signals. The whole converter is iin black ABS case (dimensions 68x45x24mm) which can be installed, for example, to the wall by pegs. On the top of the case there are for two LED diodes signalizing the data receiving and transmitting from each interface, power supply and set up a connection through USB port or buffer overflow. To connect interfaces RS232/RS485 signals, there is terminal block junction and to USB the socket on the one side of the case.